Proof coinage refers to special early samples of a coin issue, historically made for checking the dies and for archival purposes, but nowadays often struck in greater numbers specially for coin collectors (numismatists). Nearly all countries have issued proof coinage. Preparation of a proof striking usually involved polishing of the dies. 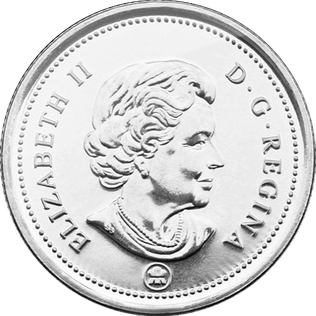 They can usually be distinguished from normal circulation coins by their sharper rims and design, as well as much smoother "fields" – the blank areas not part of the coin's design. The dies for making modern proof coins are often treated with chemicals to make certain parts of the design take on a frosted appearance, with the polished fields taking on a mirror finish. Several other methods have been used in the past to achieve this effect, including sand blasting the dies, and matte proofs. Proof coins of the early 19th century even appear to be scratched, but it was part of the production process. The term "proof" refers to the process by which the coins are made and not to the condition of the coin. Certification agencies can grade and assign numerical ratings for proof coins. A PR70 coin is the highest grade possible for a proof coin and indicates a perfect example, with PR69 and lower grades reflecting some deficiency in the strike, centering, details, or other aspect of the coin. Most proof coins are double struck under higher pressure. This does not normally result in doubling that is readily observable, but does result in the devices being struck fully. 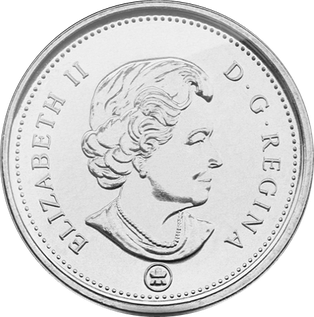 After being struck, they are separately and individually handled, in contrast to normal coins which are thrown into bins. The U.S. had largely stopped striking proof coins in 1916, although a few later specimens exist. From 1936 to 1942, proof coins could be ordered individually from the U.S. Mint. Beginning in 1950, customers could order proof coins only as complete sets. Sets struck from 1936 to 1942 (1942 offered a five-coin and a six-coin version, the latter included the silver wartime nickel) and from 1950 to 1972 include the cent, nickel, dime, quarter, and half dollar. From 1973 through 1981 the dollar was also included, and also from 2000 on. The 1999–2008 proof sets also contain five different Statehood quarters. The 2004–2005 series also contain the two Lewis and Clark nickels. The 2007-2016 proof sets also include Presidential dollars. The 2010-2021 proof sets also contain America the Beautiful quarters, depicting different National Parks and Monuments. Proof sets issued in 2009 contain 18 coins – the most ever included – as that year featured four different reverses for the Lincoln Cent, six quarters issued under the District of Columbia and United States Territories quarters program, four Presidential and one Native American dollar struck that year, and the five cent, dime, and half dollar coins. Proof sets containing only 2009 cents, Statehood quarters, America the Beautiful quarters, and Presidential dollars are also available. The U.S. Mint has also released special proof sets, such as in 1976, when a proof set of three 40% silver-clad coins: the quarter, half-dollar and dollar coins depicting special reverses to commemorate the U.S. Bicentennial was issued. From 1971 to 1974, proof silver-clad Eisenhower dollars were issued in a plastic case contained in a brown wood-grain finish slipcase box, and are referred to as "Brown Ikes". Proof Susan B. Anthony dollars were struck in 1999. Although these proof dollars were sold separately and not included in the proof sets for that year, some third parties used the cases from other years to create 1999 proof sets that include the dollar, prompting the U.S. Mint to advise the public that these sets were not government-issued sets. A proof "Coin & Chronicles" set was issued for 2009, which included one each of the 4 different Lincoln Cent designs and a commemorative Lincoln Silver Dollar, presented in special packaging. Other sets, called "Prestige Proof" sets, also contain selected commemorative coins. These sets were sold from 1983 to 1997 (except 1985) at an additional premium. As Legacy Proof sets, the practice was resumed from 2005 to 2008. Occasionally, there are errors which escape the Mint's inspection process, resulting in some very rare and expensive proof sets. This has happened at least seven times: 1968-S, 1970-S and 1975-S and in the 1983-S Prestige set, each with a dime that has no mint mark; a small number of 1971-S sets included a nickel without a mint mark; 1990-S saw both regular and Prestige sets which included a penny with no mint mark. Not as rare (or as expensive) are proof sets issued with coin varieties that are less common than those found in other sets issued in the same year. These include the 1960 and 1970-S sets, both of which are found in either a "small date" or "large date" variety, which refers to the size and position of the date on the Lincoln cent. The 1979-S and 1981-S sets each come in either a "Type I" or a "Type II" version, where on all coins the "S" mint mark is either "filled" (also known as the "blob" mint mark) or "clear". 1964 has a design variation where the President's portrait on the Kennedy half-dollar has "accented hair". The design was modified early in the production (reputedly at the request of Jacqueline Kennedy) to give the hair a smoother appearance. This resulted in the "accented hair" variety being somewhat rarer and commanding a premium over the "regular" variety. Since 1992 the mint has struck proof sets in both silver and base metal. Also, "Silver Premier" sets, featuring deluxe packaging, were offered from 1992 to 1998. U.S. commemorative and bullion platinum, palladium, gold, and silver coins are also often issued in both uncirculated and proof types, sometimes with different mint marks. Starting in 1947 the U.S. mint began producing "mint sets", and because of the terms used there is some confusion over the difference between these and proof sets. 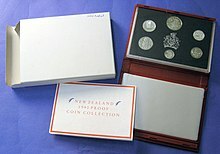 These are uncirculated coins that have been specially packaged, and are generally neither as expensive nor as valuable as proofs. There are some exceptions, however. Those produced from 1947-58 (none were made in 1950) were double sets packaged in cardboard holders and have good collector demand. Because mint sets contain specimens from each mint the precious metal value of the coins in a mint set could exceed the value of a proof set for common dates. Another exception is the 1996 mint set, which, in addition to specimens from the Philadelphia and Denver mints, contained a Roosevelt dime from the West Point mint (commemorating the 50th anniversary of the Roosevelt dime) and which was available only in this mint set. From 1965-67 the mint did not sell proof or uncirculated coins, but only a hybrid product, "special mint sets", none of which are particularly valuable. From 2005 through 2010 the U.S. Mint used a special "satin finish" on the coins in its uncirculated sets, but in 2011 changed to a "brilliant finish" so that contact marks incurred during the normal production process would be less noticeable. The Philadelphia and Denver mints also sell annual "souvenir sets" from their production runs. These are not mint sets and generally not of high collectable value, although the 1982 and 1983 sets are in demand, since no "official" mint sets were issued during those years. Finally, individual dealers have made unofficial "year sets", privately packaging all denominations of a certain date. The latter have no value beyond their individual coins. Members of the public should be careful to understand what products they are being offered, and that, until supplies are exhausted, current and previous mint and proof sets are available directly from the mint. Dannreuther, John W. (2004). Official Guide to Coin Grading and Counterfeit Detection (2nd ed.). New York: House of Collectibles. p. 432. ISBN 0-375-72050-2. ^ George Greenlief Evans (1892). Illustrated History of the United States Mint: With Short Historical Sketches and Illustrations of the Branch Mints and Assay Offices, and a Complete Description of American Coinage ... G. G. Evans. pp. 178–. ^ "Proof Coinage Catalog". Colnect. Retrieved September 18, 2014. 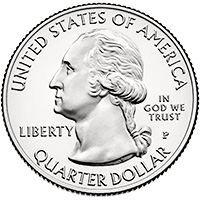 The quarter, short for quarter dollar, is a United States coin worth 25 cents, one-fourth of a dollar. It has a diameter of .955 inch (24.26 mm) and a thickness of .069 inch (1.75 mm). The coin sports the profile of George Washington on its obverse, and its reverse design has changed frequently. It has been produced on and off since 1796 and consistently since 1831. The Eisenhower dollar is a one-dollar coin issued by the United States Mint from 1971 to 1978; it was the first coin of that denomination issued by the Mint since the Peace dollar series ended in 1935. The coin depicts President Dwight D. Eisenhower on the obverse, and a stylized image honoring the 1969 Apollo 11 Moon mission on the reverse, with both sides designed by Frank Gasparro. In coin collecting, a key date refers to a date of a given coin series or set that is harder to obtain than other dates in the series. The next level of difficult to obtain coins in series are often referred to as semi-key dates or simply semi-keys. The San Francisco Mint is a branch of the United States Mint and was opened in 1854 to serve the gold mines of the California Gold Rush. It quickly outgrew its first building and moved into a new one in 1874. This building, the Old United States Mint, also known affectionately as The Granite Lady, is one of the few that survived the great 1906 San Francisco earthquake. It served until 1937, when the present facility was opened. The West Point Mint Facility was erected in 1937 near the U.S. Military Academy in West Point, New York, United States. Originally it was called the West Point Bullion Depository. At one point it had the highest concentration of silver of any U.S. mint facility, and for 12 years produced circulating pennies. It has since minted mostly commemorative coins, and stores gold. The United States Mint has minted over 20 different kinds of coins, of many different sizes. Often, it is difficult for people to get a grasp of what much of the historical coinage looked like, at least in relation to modern circulating coins. This chart shows all of the coin types, and their sizes, grouped by coins of similar size and by general composition. The America the Beautiful Quarters are a series of 25-cent pieces (quarters) issued by the United States Mint starting in 2010 and scheduled to continue until at least 2021. The series may be extended at the option of the Secretary of the Treasury, potentially to 2032. The obverse (front) of all the coins depicts George Washington in a modified version of the portrait used for the original 1932 Washington quarter. There will be five new reverse (back) designs each year, each depicting a national park or national site – one from each state, the federal district, and each territory. The program is authorized by the America’s Beautiful National Parks Quarter Dollar Coin Act of 2008.